M. Hüsch, Statistical Papers (2018). Ulrike Grömping was inspired by the book to develope a package prepplot for making it easier to customize figure regions for base R graphics. See also her Vignette. Recommendation by Frank E Harrell (Statistical Graphics Course and Graphics for Clinical Trials). Andre R. S. Marcal, Assistant Professor, Faculdade de Ciencias, Universidade do Porto, Departamento de Matematica, 2017/12. 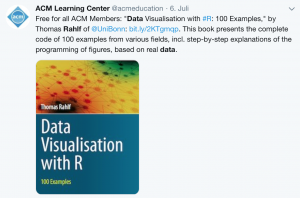 Some examples of the book have been added to the list Great dataviz examples in rstats, Prof. S. Sauer, Institute of Business Psychology, FOM Munich, 2017/11. Prof. Dr. Ulrike Grömping, Journal of Statistical Software 81 (2017). Nice application of the book’s Polar Area Charts example in: „Decision Support for Policymaking: Causal Inference Algorithm and Case Study“ from Data Science department at the IBM T. J. Watson Research Center, 2017/7. Prof. Dae-Heung Jang, Department of Statistics, Pukyong National University, Busan, South Korea, 2017/9. Listed on Springer’s Print Bestsellers (Top 100 print titles) in Computer Science (status: August 2017). Prof. Qiwei Yao, Department of Statistics, London School of Economics, 2017/7. Top Ten #ddj: The Week’s Most Popular Data Journalism Links. Buchempfehlung in dotnetpro. Das Profimagazin für Entwickler, 2/2015. Joachim König, Praxisforschung in der Sozialen Arbeit: Ein Lehr- und Arbeitsbuch, Stuttgart: Kohlhammer 2016. Karl-Kuno Kunze, R-Institute, Autor von „Ökonometrie für Dummies“, 5/2016. Wolf Riepe, Social Science Research, 3/2016. Oliver Gansser, stellv. Direktor ifes Institut für Empirie & Statistik Forschungsbüro Süd, FOM Hochschule für Oekonomie & Management, München, 12/2015. 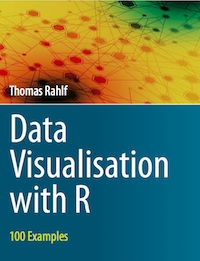 Antony Unwin, Graphical Data Analysis with R, Boca Raton, Fla. [u.a. ]: Chapman and Hall/CRC 2015. Anastasia Arkhipova, Ernst & Young Valuation and Advisory Services, Moscow, Prioritization of russian regions for Sustainable Investing Purposes using Data Envelopment Analysis, in: Review of Business and Economics Studies 2/3 (2014). ggplot2 versus Base Graphics with examples from the book: Variance Explained. What’s the best way to learn R language? Chung I Yen. Wolf Riepl, Bevölkerungsdichte in Dresden: Visualisierungsbeispiel mit R (Choroplethenkarte), 05/2015.